Prices are indicative and depend on ring sizes, the current gold price, and the actual currency rates. 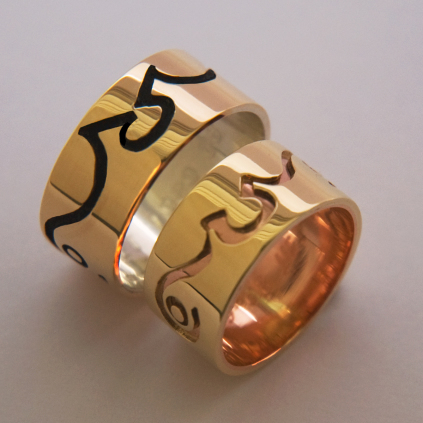 These unique wedding bands, made by hand in the minimalistic, dramatic graphic overlay style that is jeweler Zhaawano’s trademark, are constructed of warm yellow gold; the left ring has an interior of sterling silver while the ring to the right has an inside of red gold. Both wedding rings feature abstract, strongly stylized figures of two Animikii-binesiwag, or Thunderbirds, merging into one; the flowing outlines represent the thunderbirds' wings and heads. The ring to the left shows a bottom sheet of silver (the inside of the ring) that is blackened through oxidation which makes the design stand out in relief; the ring to the right has an interior of red gold that shows through the yellow gold surface, resulting in a softer contrast and adding subtle sophistication to the overall design. Inside the wing tips of both wedding rings the jeweler placed an inlaid circle of yellow gold within a bigger circle. The title of the wedding ring set, Mashkiki Genawenimaadjig, meaning Keepers of Medicine, relates to these design elements, which symbolize seeds carrying the sacred Medicine that the Thunderbirds brought a long time ago to Earth and the Anishinaabe Peoples. Binesiwag, the Thunderbirds, are said to be related to the wendaanimag noodinoon, the Winds that blow from the four corners of the Earth. Animikiig, the Thunderers, are considered the most pervasive and powerful beings of all the Aadizookaanag - Spirit Grandfathers - that guard the four cardinal points of the Universe. They leave their homes on high cliffs and mountain peaks in the west in the beginning of spring and come to Earth in different forms and guises and sizes - as winged beings, or sometimes even in human form - to vist the Anishinaabeg and to drive off malevolent underground spirits from the Earth and the waters of lakes and rivers. They are in charge of the warm weather and procure and maintain the warm seasons on Earth, which is why they migrate with the birds that appear in spring and disappear in the fall. Their thunder claps herald the presence of powerful manidoog or Spirit Beings, their lightning arrows carry strong Medicine. It is said that the eyes of the Thunderbird Grandfathers, who have a close and beneficial relationship with humans and are known to impart knowledge and foretell the future, are able to see and explore the hearts of human beings and discern their skills, talents, and desires. This brings up memories of a long time ago when the Anishinaabeg still wandered aimlessly on the face of Aki (Earth), disheartened and disorganized and standing on the brink of extinction; it was then that Grandfather Binesi was sent to Earth to aid the People in finding their place in the world and in making them aware of their collective and individual skills and talents needed for developing self-worth and for survival in a harsh and hostile environment. Thunderbird also taught the Anishinaabeg to organize themselves in doodemag (clans), thus shaping the bedrock of a strong society.